When the Commonwealth Government established the Australian Capital Territory (ACT), it developed Canberra's unique 'leasehold' land tenure system. This used the idea that individuals would not actually "own" land, as in the rest of Australia (freehold), but would rent Crown Land from the Commonwealth for a period of 99 years. This resulted in a low initial purchase price for landholders, who would pay rent to the Commonwealth for the remainder of their lease. On the 14th July 1951, the Department of the Interior held the fourth auction of residential and business leases. 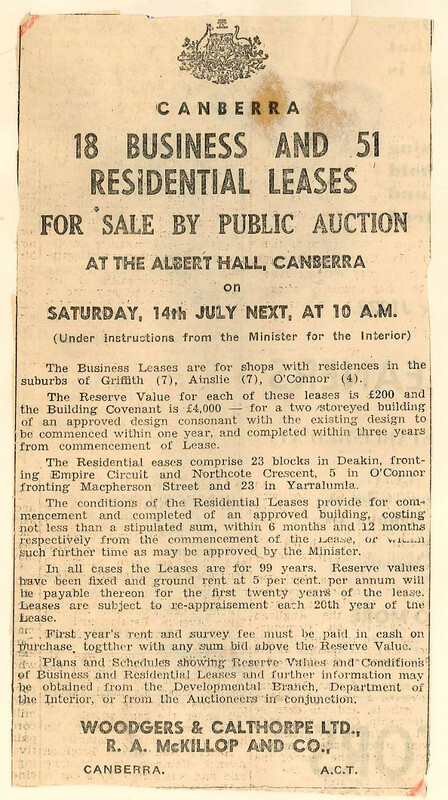 This was the first public lease auction to be held in post-war Canberra, and the first auction to take place since 1927. The file 'TL64/1831 - Department of the Interior - Fourth Auction Sale ACT Business & Residential Sites - Albert Hall : 14th July 1951' documents this auction and is ArchivesACT's Find of the Month. "In 1924, Canberra was a place of paddocks"
The Federal Capital Commission (FCC), engaging the services of estate agents Woodgers & Calthorpe, held Canberra's first lease auction on the 12th December 1924. Around 300 people attended. Up for lease were 289 residential and 104 business blocks, with 150 blocks selling for a combined total of £60,000. Woodgers & Calthorpe continued to conduct Canberra lease auctions on behalf of the Commonwealth over the next thirty-five years. The FCC held the second lease auction for 80 residential and 18 business leases on the 29th May 1926. While all the business blocks sold, only 21 residential blocks were purchased, for a combined total of £46,580. "In 1924, Canberra was a place of paddocks. Today a mighty development has taken place. It has been phenomenal. Those who bought at the first sale were fortunate and those who bought at the last sale were also fortunate. Within a month, Canberra will enter into her own as the new seat of Government of Australia. For all time, Parliament will make its laws and the whole country will be administered from here. Today affords a wonderful opportunity to invest in this country. Canberra will grow in leaps and bounds during the next few years until a population of 30,000 or 40,000 is reached, and will go on increasing as Australia increases, as happened in the United States. Australia has been slow in development, but after a certain limit has been passed, the development becomes faster. After the ten million mark has been reached, 15,000,000 will come quickly." The offerings of the 1927 auction were somewhat more modest than Woodgers' vision, with only 63 residential and 20 business leases on offer. Once again, all the business blocks sold, as well as 38 residential blocks, for a total of £69,825. This was to be the last public lease auction held in Canberra for 24 years. Under the 'City Area Leases Ordinance 1924', it was up to the Minister's discretion whether leases were to be sold through public auction or by written application to the FCC. Despite the stagnation of Canberra's development during the Depression and World War 2 (WW2), the Commonwealth continued to release a steady stream of new blocks in Canberra. Advertisements in the Gazette and newspapers requested potential lessees to apply for leases in writing and that "Full particulars including upset [reserve] prices and charges upon the land may be had upon application." After WW2, the Commonwealth Government displayed renewed commitment to Canberra as more Government departments made the move to the Capital. While most public servants took up residence in Government rental housing, there was an increased demand for land where people could build their own homes. There was also a demand for more commercial blocks to service the growing city. Between the end of WW2 and December 1951, the Department of the Interior released 63 industrial sites, 387 residential blocks and 17 sites for residential flats through written applications. "For Sale by Public Auction"
By the start of the 1950s, Canberra's population had increased to 25,000 residents. 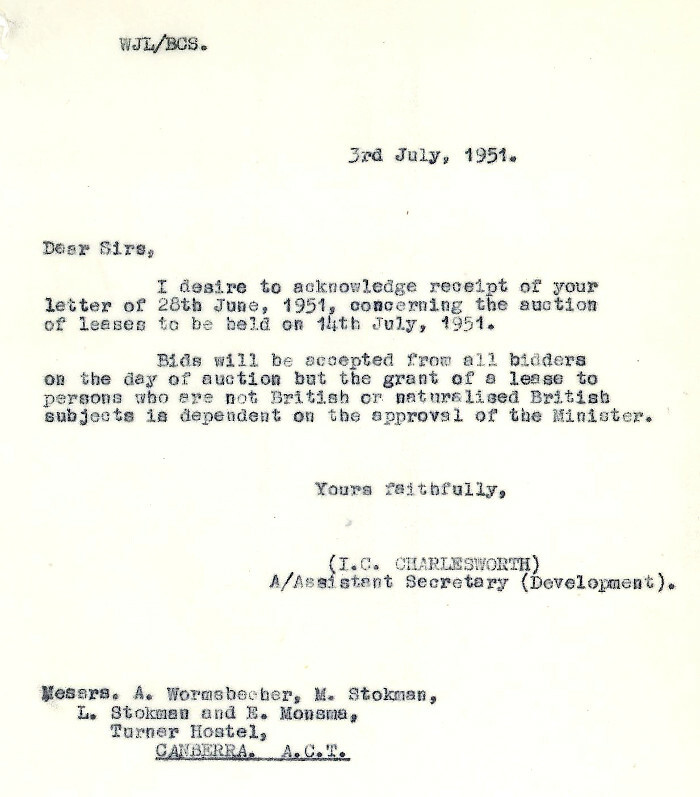 In 1951, the Minister for the Department of the Interior decided to reintroduce public auctions for Canberra leases. Instructions were provided to Woodgers & Calthorpe to organise the auction for the 14 July 1951 of 18 suburban shopping sites and 51 residential sites. 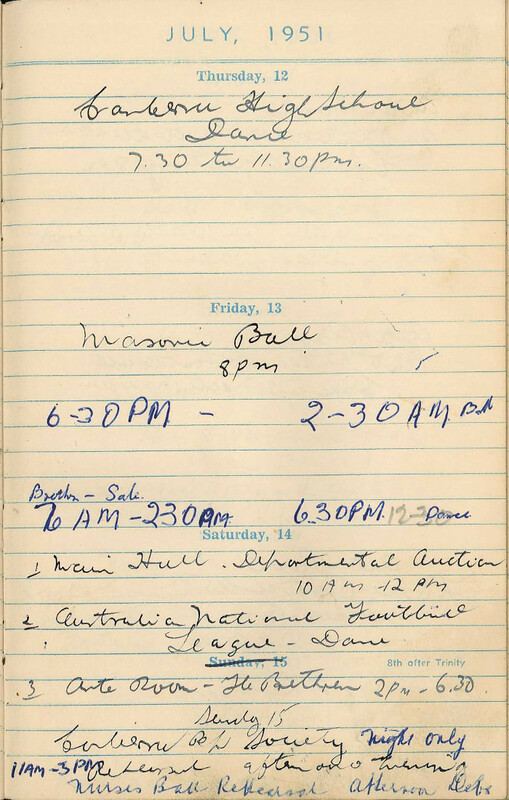 The 1951 Albert Hall bookings diary shows that the public auction was to run from 10am to midday. The auctioneers had to make way that afternoon for a "Jubilee Dance" that evening, to be hosted by the Australian National Football League for two football teams from Victoria. 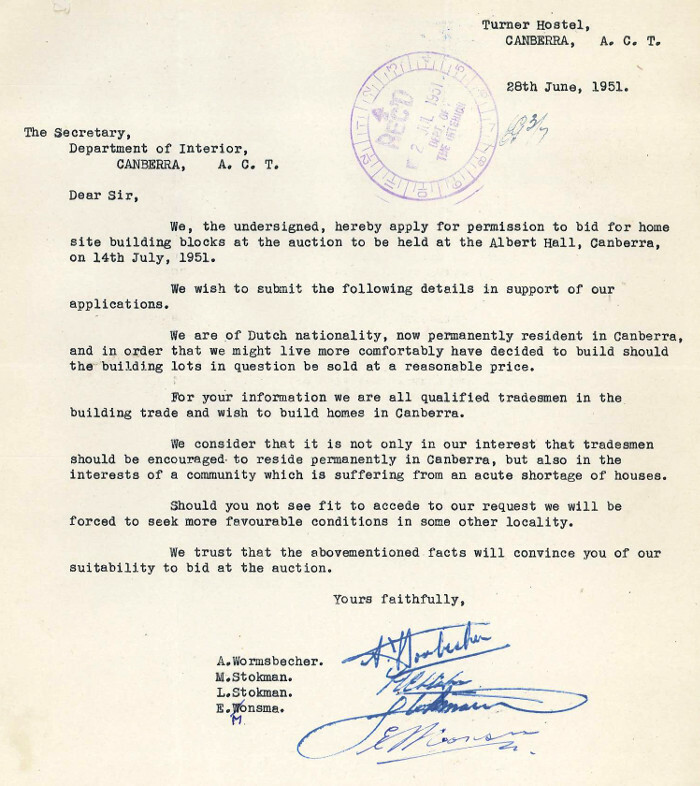 "Persons who are not British subjects"
"We are of Dutch nationality, now permanently resident in Canberra, and in order that we might live more comfortably have decided to build should the building lots in question be sold at a reasonable price." "Bids will be accepted from all bidders on the day of auction but the grant of a lease to persons who are not British or naturalised British subjects is dependent on the approval of the Minister." "A person who is not a British subject shall not at any time be capable of being a lessee or an assignee or transferee of a lease of land under this Ordinance." This Ordinance was repealed in 1936 by the 'City Area Leases Act 1936' that included the provision for the Minister to approve the purchase of leases by non-British subjects. "Will the Department provide paths, kerbs and gutters in front of shops?" Newspaper reports at the time estimated the attendance at the fourth auction to be around 500 people. If held today, many of those attending may have recorded the event on their smart phones. We are fortunate that in the pre-social media era, Department of the Interior Senior Clerk, F.A. Mitchell, produced a detailed written account of the auction. Bidders had a number of questions about the lease conditions and related issues, such as when Northcote Crescent in Deakin would be completed, and whether the Department provide paths, kerbs and gutters in front of shops. A statement by the Department of the Interior, read by W.G. Woodger, laid out the terms and conditions of the sale. Some of these were quite complicated, and involved the calculation of 'ground rent', temporary rebates and survey fees. Bidders could only purchase one business block in a particular business centre, and only two in a particular residential centre. Most leases came with the condition that the purchaser build a brick fence.